What’s the best way to draw reluctant readers to books? Abu Dhabi’s National Library is trying out a number of different strategies. They’ve got book vouchers for kids who attend the book fair. Writing programs. Reading competitions. And this latest one (left) looks suspiciously like any boxy, glass-fronted machine in which you’d find brightly wrapped, chemically brightened, teeth-rotting delights. This vending machine’s mechanisms work much the same way, although the books aren’t nudged from their perch down to the drop box. There’s no satisfying thunk. I suppose it would hurt the books. Instead, once a book is selected, it’s pushed into a cradle that lowers it gently down to the reader. In a world of e-book-this and app-thing-that, I think this is a wonderful, fun, retro idea – which will be implemented in several Abu Dhabi malls in the next two months. However, in a couple ways it’s not (yet) particularly practical. As Emirati writer Noura Noman noted on Twitter, the means have become the end. The main problem is this: Although a variety of different books fill the machine in neatly arranged rows, “we can take only the first book” in each row, systems librarian Salem Salama explained. He let me and journalist-publisher Vinutha Mallya test out the machine at the National Library booth at the Abu Dhabi International Book Fair last week. “We requested another model,” Salama said. “The other model comes with more than 350 books and it will just go with a robotic arm and pick the book for you.” But Salama didn’t know if the request for the new model would be approved. 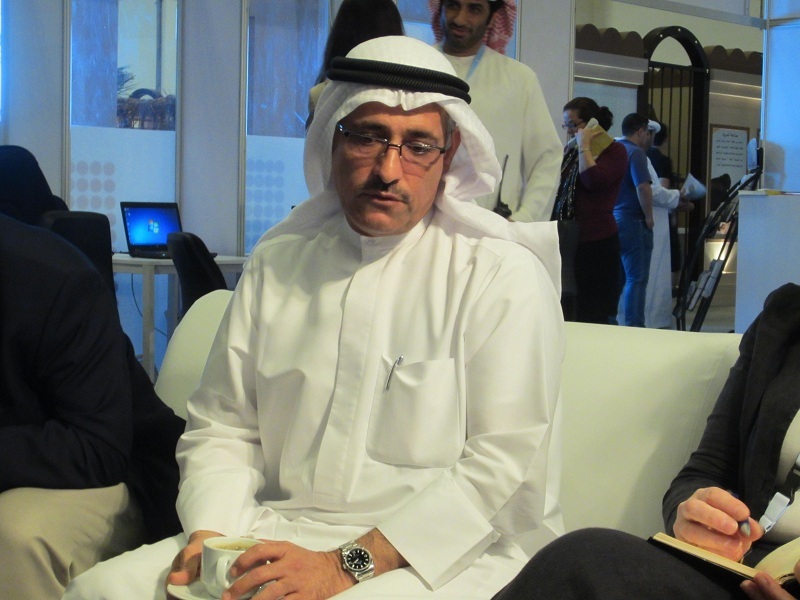 “This is in addition to the mobile libraries,” al-Qubaisi said. The book vending machines, which will work with a library card, will go to malls where there are no libraries being built. And “eventually,” Salama said, “we’ll add a purchasing unit” to the vending machines. This is complicated by the fact, he said, that books are many different prices. Al-Qubaisi, who is also deputy director general for the National Library, said that he expects around 90 percent of the books in the machines will be in Arabic and around 10 percent in English, a marked difference from bookshops around the Emirates, where a far larger percentage of the books are in foreign languages. He didn’t make any mention of Hindi, Urdu, Malayalam, Farsi, or other languages widely used in the Emirates. 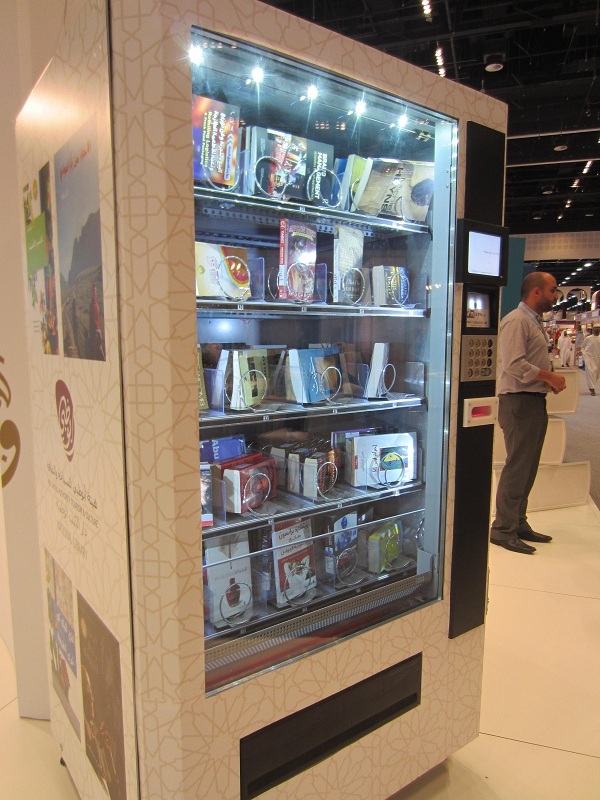 These sorts of book vending machines are already available in some locations in Saudi Arabia, Salama said. But this will be the first time they’ve been tried out in the Emirates. Since I’ve gotten marginally better at photography, I thought I’d show you a new trick. Video! Why is it sideways? I don’t know! But in any case, Vinutha demonstrates how to get a library book out of the machine.